The Great Rift Valley runs through the country from north to south. In this deep trough lies Lake Malawi (also called Lake Nyasa), the third-largest lake in Africa, and the 10th largest in the world, making up about 20% of Malawi's area. Landlocked Malawi ranks among the world's least developed countries. The office serves the whole country consisting of 4 provinces. Also serves Nyasa, Zambezia, and Tete, Provinces of Mozambique. The office is operating from the Southern Province of Malawi. I was raised in a very strict Muslim setting, as my family was deeply rooted in Islam for many generations, and my father himself is a well respected leader. By the Grace of the LORD, in 1986 during school holidays, my childhood friend testified to me about his newly found faith. He even introduced me to a minister in the Message who talked to me about baptism. I made an instant decision to embrace the Message of the Hour, knowing very well the drastic consequences I would suffer from my father, family, and friends. I was to learn later on that I had underestimated my father's reaction. I endured many forms of physical persecution from my father, but nothing could shake me. He later on disowned me completely and chased me from home. I became completely destitute and my remaining years of high school were an extreme torture. I solely depended on willing brothers who would keep me in their homes. Voice of God Recordings started its operations in the home of Brother Dixon Kandoje in the 1980's; then as a distribution center for the books and tapes and a messages Translation make-shift office. Later in 1989, Brother Mostapher Saidi was taken on board to assist in the operations of the library and in the translation work. In December 2001 a team of VGR representatives came to Malawi, after being sent by Brother Joseph Branham to identify offices for the operations of Voice Of God Recordings. Their mission was very successful and consequently in January, 2002, Malawi VGR office was officially opened, and Brother Mostapher Saidi was made it's full time office manager in August of the same year. The office quickly grew from a simple house operation to a busy, fully-fledged national office, implementing a basket of activities, operating 9 hours a day, Monday through Friday, and 3 hours on Saturdays. Serving the entire country with approximately 25,000 believers. As time went, the rented premises became too small for the fast growing operations of the office. As churches in Malawi started to patronize the library more and requests for Message materials from the churches around Malawi and part of Mozambique swelled up and became overwhelming, space was fast becoming a serious issue. Allow me at this point to take a diversion and thank the Lord for Brother Joseph Branham, because every request sent to the head-office in the U.S.A. for message materials was being honored, and all the materials requested would be shipped massively. The 20 foot container placed outside the office was too small to warehouse all the materials. Pastor Jimmy Chiwaula of Kanjedza Believers Church, saw the need and he generously offered part of his house for the storage of our books, God should bless him for his love for the VGR work. The year 2006 opened a new chapter for the VGR work in Malawi; a VGR team visited and formed part of pastors meeting at Shire highlands Hotel. At this meeting where Pastor Blessings Chesa of Zimbabwe was in attendance, reference was made to what the Believers did to support the VGR efforts in Zimbabwe, this moved Malawi ministers into action. In a very short time the ministers requested the office to call for a follow-up meeting on what was discussed at Shire highlands. At that meeting, the pastors unanimously agreed to embark on a building project of an office for the work of Voice Of God Recordings. On 9th April 2008, a plot was purchased from Blantyre City Assembly through the efforts of the local ministers. By 2009, the constructions of the offices had started and thank God for Brother Joseph Branham who the Lord had placed a burden upon his heart to just pick up the project and magnificently brought construction work to completion in 2013. Now Malawi has state of the art VGR offices; a big warehouse, a recording studio, a reading room, 2 big offices, a kitchen, a break-room, and a bigger display area. There are over 350 churches, 68 seed libraries, and 8 full libraries that receive supplies from the office. The office maintains a close supervision of all the libraries across the country to ensure that they are properly operated within the policies and regulations of VGR. Translation work constitutes one of the major components of the work. The primary translation language is Chichewa. Chitumbuka and Kyangonde languages were later introduced on the translation profile. Before Voice of God Recordings opened offices in Malawi, Brother Dixon Kandoje had a burden to do translation work, and did this from his house. At that time Chichewa was the only language that was being translated. His work is greatly appreciated as he did so from his personal resources. When VGR offices were opened in 2002, Chitumbuka and Kyangonde languages were included on the translation profile. Chichewa is also widely read in part of Mozambique, especially Nyasa, Zambezia and Tete provinces. Chichewa interpreted sermons are extensively used in Malawi. Some churches play Chichewa interpreted tapes as part of their Sunday school classes before the main Sunday service. In the early 1970s beloved ministers and teachers of various denominations made a request for the “Message materials” from the Spoken Word Publications. That move failed to establish a church in Malawi; the impenetrable darkness still existed in spite of these message books arriving in Malawi and freely and earnestly read. These denominational ministers never met for discussion to see the degree of luminosity and the underlying deep meaning in the books and how to use the treasures of the Message books. They treated these books as any other ordinary religious books, and not as a Message to call out the Bride of Christ. It was only until the early 1980s when a brother came to Malawi at the invitation of some denominational ministers when his ministering to groups and individual Christians started to produce fruits. For the first time the Message was preached and the prophet of God, Brother William Marrion Branham was introduced in a comprehensible manner. Soon some of the participants openly said that they wanted to know more. In years that followed, fellowship groups in the city of Blantyre opened their doors to more visiting ministers. It was during this time that a few in Limbe and Blantyre sought our Lord for a fellowship. One group was formed at Bangwe Church Centre, and began to be recognized as a fellowship whose members had remarkable ministerial abilities, loving and giving. Whenever fellowship groups organized meetings for the visiting ministers, the other groups would be invited. Together they brought about a revival in the city. God set the Bangwe fellowship as a base for the Message to spread throughout the country. PECOM continued to extend invitations to foreign preachers who gave testimonies and showed the strength of this Message, for instance, the power of God during Brother William Branham’s visit to South Africa. Guided by this spiritual conviction, this process of evangelism prevailed over church ministering. What remained was close coordination of this local evangelism with the foreign evangelists. People embraced and accepted the Message to be the Truth, but due to denominational affiliations, many abandoned it. Bible Believers as a church in Malawi has a rather amazing and unique history dating back to 1978. During a brief period when a few brothers came to Malawi, something started working out towards establishing a Message Church in Malawi. Brother Paddington Ngwira and Brother Martin Mkandawire took up evangelism nationwide in spite of politically and religiously motivated restrictions. History records the threats and intimidation, and the battles were won through the adventures that was taken to spread the message. The most difficult time was in the early 1980s during the reign of one party government. This was a critical period because it was very dangerous to stage a protest against a policy, organize a meeting, or preach the Word of God at a public assembly without permission from the government. You would be prosecuted by the unknown authority as an enemy of the people and your end would sometimes not be easily established. Yet this evangelism team’s work saw unequalled success. The message was spread within the shortest period of time from Nsanje to Chitipa. Believers’ fellowship groups invariably emerged throughout Malawi under the pastorship of Brother Dixon Kandoje, and in particular, Bangwe became the central place of all operations. The revival shook Blantyre City, University of Malawi constituents’ colleges, High Schools, and many other places which resulted in a mass exodus of people leaving their denominations for the message until the Church center where we were gathering became too small. Yes, the urgency of such efforts, the success, through unthinkable spread of the Message in Malawi can only be attributed to the reality of the Lord. It has been such a wonderful experience to have this Message spread throughout our own nation. God has also blessed Malawi with wonderful ministers who have done a tremendous job with this Message in our country. Their effort has helped to create a conducive environment for Brother Joseph Branham to set up operations in Malawi for Voice of God Recordings. Praise God for that. Voice of God Recordings Malawi office is located in the central business district of Blantyre, off Kanjedza round about, along the Jomo Kenyatta Street, next to PIPE IT, Limbe-Blantyre, Malawi. The Malawi youth gather to worship The Lord. Independence Day in Malawi became a different kind of celebration. 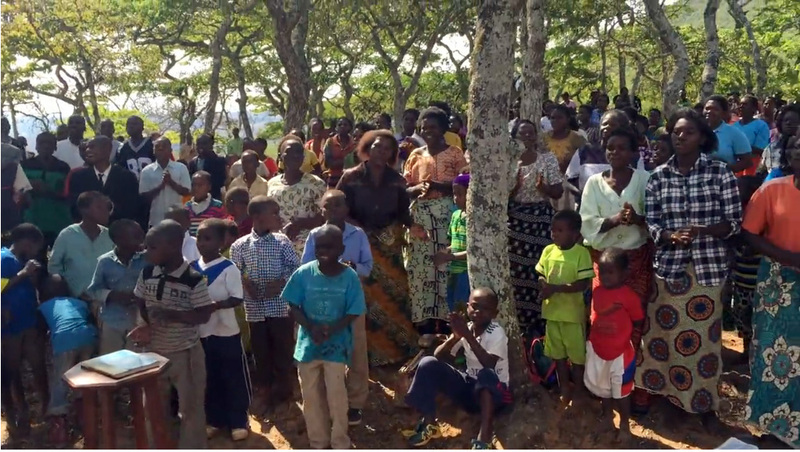 Believers in Malawi join in hearing of the Word and songs of praise. QT and bonfire in the Malawi countryside. 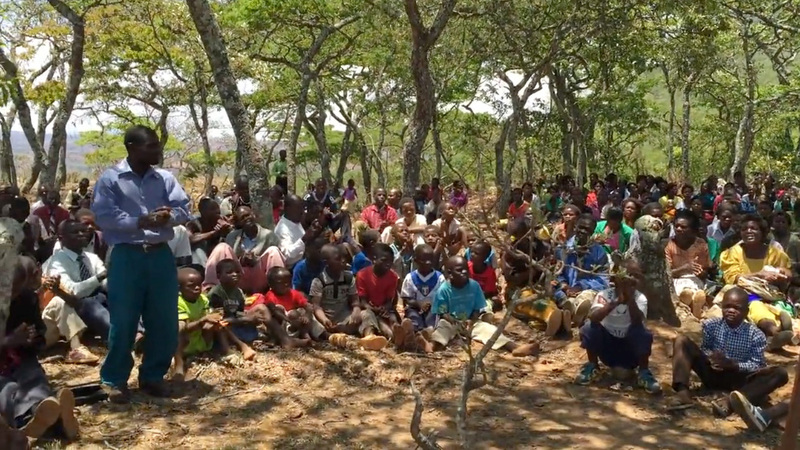 The youth in Malawi gather for Quiet Time and bonfire. The youth in Malawi gather for the country’s first YF bonfire. 280 miles, a YF delivery, a Total Deliverance. In 2016, the VGR tape outreach team crisscrossed the country and borders to baptize 994 souls. 83 souls gave their hearts to the Lord Jesus. The Tape Ministry is alive and well! They were all attracted by the Voice of God. Thank you for keeping us in your thoughts and in your prayers. This Message shall never lose Its power. This was the first time the people around this area had witnessed such an arrangement. 100 homes in less than 100 days. Update on the relief efforts in Malawi. The whole day is dedicated to worship and song. 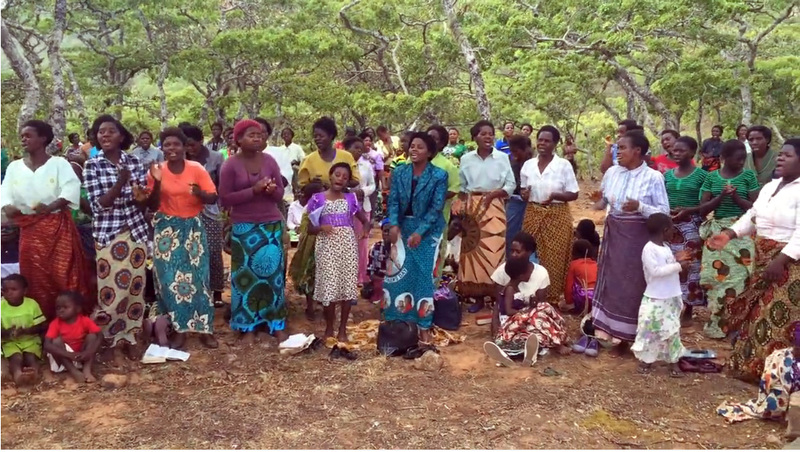 Songs of worship in Malawi. Houses are being built at different sites. We negotiated our way through swamps that were created by the floods. The country of Malawi continues to battle the worst flooding in its history. The believers in Malawi need our prayers. The elders explained that they had heard the Message on the radio. Ten people have already been baptized! Sometimes, our MP3 players don’t have the volume they need. The recent CTV update gave the testimony of a denominational church in southern Malawi that was recording Brother Branham’s services from a radio broadcast.